Some of the most coveted law enforcement jobs are found in the federal government. Federal law enforcement jobs tend to come with higher salaries, great health benefits, and generous retirement packages. They're available at several different agencies, all with unique but important missions and encompassing all manner of specialties. The Federal Bureau of Investigation is perhaps the best known and most famous federal law enforcement agency. The FBI falls under the control of the United States Department of Justice and is responsible for investigating crimes related to domestic security. This includes computer crimes, financial crimes, kidnapping, and terrorist threats. 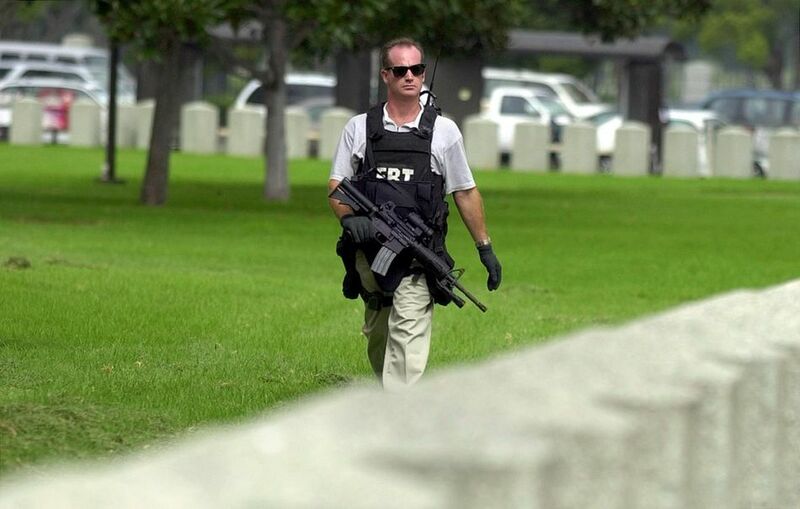 FBI special agents work in field offices across the U.S. and around the world. A bachelor's degree is required at a minimum. Candidates with master's degrees, juris doctorates, and relevant work experience are preferred. Agents attend the FBI Training Academy in Quantico, Virginia and are assigned to field offices upon graduation. The FBI has several career paths within the special agent program including law, financial crime, computer fraud, and general law enforcement. This branch of the federal government focuses on enforcing laws and regulations in the area of illegal drugs, including both pharmaceuticals and chemicals as well as street drugs. The DEA also works under the authority of the U.S. Department of Justice. Some DEA agents are known as diversion investigators, but the DEA also employs special agents who have law enforcement authority. Diversion investigators are investigation specialists. Although an advanced degree isn't technically required, the education associated with a master's degree or PhD can be helpful and set you apart from other applicants. You must be a U.S. citizen, and you must pass a drug test and background investigation. Candidates must have valid driver's licenses and unimpaired or corrected vision and hearing. United States Immigration and Customs Enforcement employs special agents to investigate crimes related to human smuggling, drug trafficking, money laundering, and violations of immigration law. Special agents conduct civil, administrative, and criminal investigations. An ICE agent typically holds at least a four-year degree, although relevant work experience can substitute for education requirements. Preference is given to those with prior law enforcement or military experience. Experience in a leadership or management position is also desired. The United States Secret Service is best known for protecting the U.S. president, but it's also responsible for securing the nation's treasury and protecting the U.S. currency as well. In fact, the primary function of the Secret Service is to safeguard U.S currency and prevent counterfeiting. Secret service agents can be called upon to augment security details around the U.S. for high-ranking officials and visiting diplomats. Secret Service agents receive training at the Federal Law Enforcement Training Center in Glynco, Georgia, as well as specialized training in the Washington, D.C. area. In addition to special agents, the United States Secret Service also employs its own uniformed police force. These officers provide security at installations around the Washington, D.C. area, including the White House, the Treasury Building, and the vice president's residence at the United States Naval Observatory. Uniformed Secret Service officers are also responsible for security at foreign embassies around the capital. They travel with Secret Service special agents to augment presidential and dignitary security details around the country and around the world. Uniformed secret service officers train at the Federal Law Enforcement Training Center in Glynco, Georgia. They also receive specialized training near Washington, D.C. The Bureau of Alcohol, Tobacco, Firearms and Explosives also works under the jurisdiction of the Department of Justice. Investigators and Special Agents are scattered in field offices across the country and they handle cases of arson and terrorism, as well as organized crime and the illegal trafficking of firearms, explosives, alcohol, and tobacco products. The ATF is divided into three distinct enforcement units or areas to handle all this activity: Alcohol and Tobacco, Explosives, and Firearms. Applicants must be U.S. citizens. They can be no younger than 21 years of age, and no older than 36 at the time of hiring. They must have valid driver's licenses. A high school diploma is required, but possessing a bachelor's degree in a criminology or criminal justice is preferred. You must submit a handwriting example and pass several tests, including a medical assessment and a physical abilities test. Special agents must pass the ATFE special agent exam. All applicants must undergo polygraph tests, drug screenings, and background investigations. The United States Marshals Service is the oldest federal law enforcement agency in the U.S. It's also perhaps the most storied. The agency of Wyatt Earp and Doc Holliday is known as the enforcement arm of the federal court system. Ninety-four marshals oversee as many districts. Their deputies are responsible for providing court security and witness protection. Deputy marshals also conduct enforcement of federal court orders, arrange for prisoner transport, and provide for the detention of those awaiting trials in federal courts. The marshal's service assists local agencies in capturing escaped fugitives and it oversees the Federal Witness Protection Program. Upon appointment, deputy marshals receive training at the Federal Law Enforcement Training Center in Glynco, Georgia. NCIS agents provide special investigative services for the U.S. Department of the Navy and the United States Marine Corps. Special agents work on U.S. Navy installations around the world and they investigate major crimes involving Navy personnel and property. Special agents are also stationed on Naval ships while at sea. NCIS special agents are responsible for the investigation and enforcement of crimes that will result in prison time of a year or more under the Uniform Code of Military Justice or major felonies under local or federal law. Members of the United States Border Patrol are responsible for securing the nation's borders. Agents work along the Mexican and Canadian borders, as well as oceanic regions surrounding Florida, Puerto Rico, and the U.S. Virgin Islands. Border patrol agents conduct investigations, track subjects who have entered the country illegally, and work to curb and prevent incidents of human trafficking and drug smuggling. The U.S. Border Patrol also plays a special role in preventing terrorism by working to keep both terrorists and weapons of mass destruction from crossing the borders. Agents attend the U.S. Border Patrol Academy in New Mexico. The academy is known as one of the toughest law enforcement academies in the country, and all graduates must be able to speak Spanish functionally before they report for their first duty assignment. The U.S. Armed Forces and the Pentagon employ civilian police forces to augment their own military police units. These officers provide law enforcement services on bases and military installations. They might stand guard at checkpoints, conduct minor criminal investigations, or assist specialized investigative units when uniformed officers are required. Department of Defense police officers also conduct traffic enforcement and they respond to calls for service on base. Their jurisdiction is limited to the base on which they serve or installations under the control of the military branch by which they are employed. Some bases and installations may have memoranda of understanding with local communities to allow for enhanced patrols outside the military facilities. If you're looking for a career that is interesting, exciting and also well-compensated, consider a job in law enforcement with the federal government.